“True” is an exceptional animal by any standards. Fast, strong, graceful, and tenacious, he is a marvelous example of what 100 years of selective breeding can produce. True began his hunting career before he reached 5-months of age and it remains his great passion. At the same time, he is a wonderful, well-mannered family pet who brings a smile to all who meet him. True is the product of dam Maggie’s Bend and sire Flashy Southern Arrow. Maggie is daughter of Hall of Fame/11xCh Tekoa Mountain Sunrise, the all-time leading producer of setter champions and winners. Her mother was the leading living dam of setter winners, and a full sister to three champions, including Hall of Fame/9xCh Hicks Rising Sun. Arrow is grandson of Tekoa Mountain Sunrise and Sunflower Sunset, and also hails from Ch. Johnny Crockett and Ch. Cash Master lines. 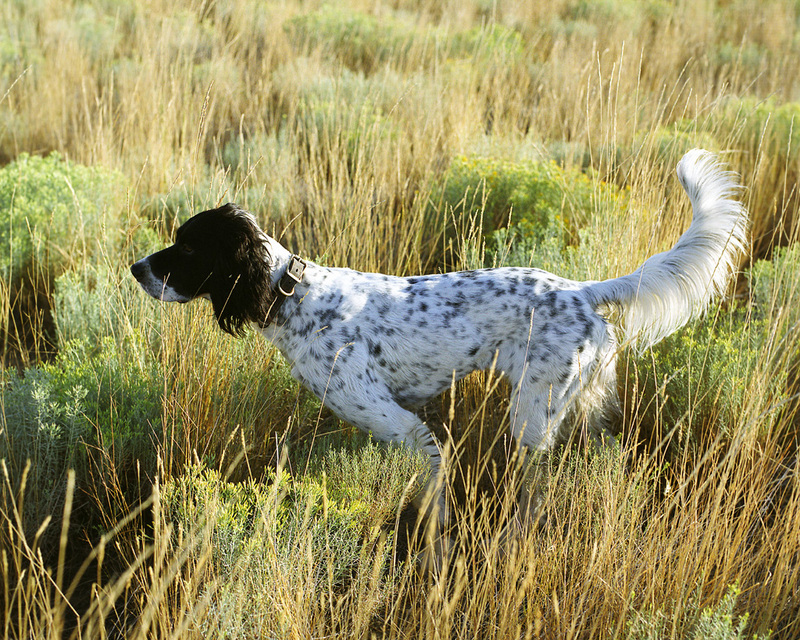 True's hips scored in the 90th percentile for all English Setters tested by the PennHIP protocols. True was entered in his first NSTRA field trial as a bye-dog at 10-months of age because we needed a replacement for our female, Bonne, whose season had arrived. Although he did not earn a placement (he was only 10-months old, after all) his ability was demonstrated. It has taken time for True and his novice handler to learn to work together. The initial challenge was the dog’s ability to locate birds at great distance, and a handler who was not sufficiently experienced to look for the birds at so great a distance. We have been working through that though, with True establishing point a little closer, and me searching a little wider. At 11 months True earned his first 1st Place and by 16 months (after only 2 ½ months of periodic trial competition) he added a 2nd, 3rd, and two 4th Place wins to his sheet. True is a remarkable dog who has impressed judges sufficiently with his style and skill to have earned multiple perfect scores for “finds” (100 points) and “honoring” (75 points), and near-perfect scores for retrieves in very difficult situations (98 and 97 points awarded). This dog is a genuine pleasure to watch and to handle. True has continued to display incredible stamina in the field. It is no surprise for a hunting dog to continue to run long after he has passed his effectiveness threshold, but True has yet to reach that point. The dog covers mile after mile, hour after hour. Virtual hunting? He can keep up with any dog. At 14 months, True was one of the only dogs available to fill in (after his scored braces) on the third day of a particularly demanding trial, where many dogs were unable to perform because of the rugged terrain wearing on their feet. True’s agility and grace somehow allowed his feet to maintain top condition. At just over a year of age, his performance as a non-scoring bye-dog was remarkable, and he ran 5 complete braces (amassing 15 finds) on that day alone. True completed his first NSTRA Championship title on October 1st, 2006. A remarkable 27-point season in 2006-2007 (15th of all dogs, nationally) led to his second Championship, which he completed on May 6, 2007. Since then, True has continued to be highly competitive. By the end of the 2008-2009 season, he had earned four Championships. During that season, True was the high-point dog in the Northwest Region and was again in the top 20 dogs, nationally. Each season, True continues to give us wonderful experiences hunting, trialing, and just being. 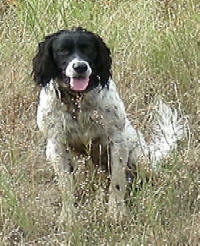 Now, as a mature dog, he is so dependable, so predictable, and so reliable that the hunters can nearly run on auto pilot. Nonetheless, we nearly always hunt him with a GPS collar, as he can still get out of site in the blink of an eye!